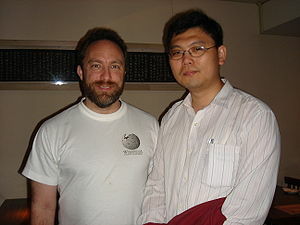 Hi, I'm Hsiang-Tai Chien and I'm editing mostly on Chinese Wikipedia, English Wikipedia and Chinese Wikinews. I'm a member of the Wikimania 2007 organization team and I'm responsible for communications and translation. Welcome to contact me if you have any opinions on Wikimania 2007 or you want to contact the organization team. I was born in Taipei, Taiwan and grew up in Hsin-Chu, Taiwan. I'm educated in Mandarin Chinese and I can read/write Traditional Chinese and read Simplified Chinese as well. I study English since my junior high and now use English in my work every day. I live in Taipei, Taiwan which is in UTC+8. If you find this page on any site other than Wikimania 2007, you are viewing a mirror site. Be aware that the page may be outdated, and that the user this page belongs to may have no personal affiliation with any site other than Wikimania 2007 itself. The original page is located at http://wikimania2007.wikimedia.org/wiki/User:Htchien . This page was last edited on 11 October 2007, at 16:05.